Vaughn Velocity V7 XF Int. Chest & Arm Pad | Sports Etc. 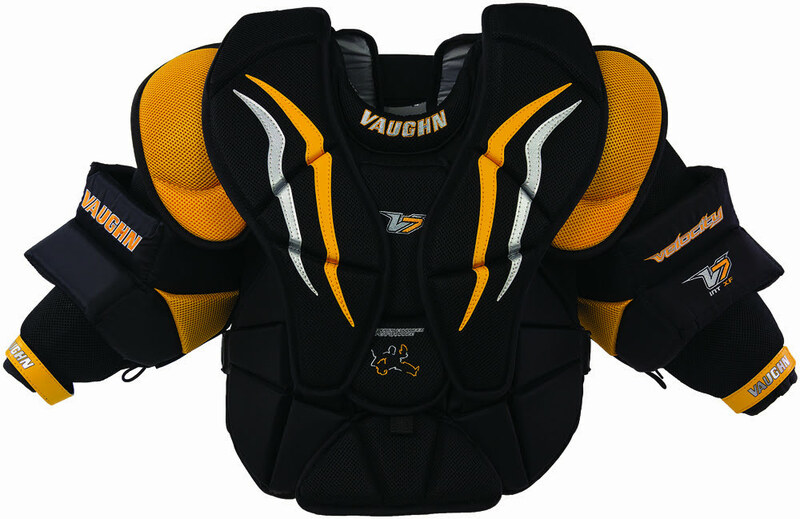 The chest pad is constructed with the new V7 design using layers of high and Ultra-high density foams and a lower belly flex section. Large shoulder floaters have Ultra-high density foam internal components for extra rigidity and shock dispersal. Large shoulder caps extend to the sides for more net coverage and give more complete protection. Sports Etc Performance To Value Rating– 8 out of 10. Designed after the pro model chest protector- this chest pad is great for a younger goalie looking for a little added protection.